- Pop Uprights to Play is a new thing coming from the Village of Homewood (where is that? Southwest of Chicago). Their website is worth a look, if only for the URL. 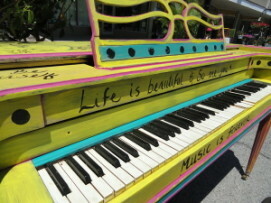 "Local artists and service groups are painting murals on donated pianos to be placed around Homewood with an invitation for anyone to tickle the ivories regardless of musical talent. Pop Uprights to Play will be unveiled during the 4th of July parade and be available at the Family Fun Fest at the Izaak Walton Preserve immediately following the parade at 12 a.m. Pianos will appear around Homewood throughout the summer until Homewood&apos;s annual Fall Fest and Chili Cook Off on September 15, 2012." - The Chicago Theatre Off Book Bowling Party has added a few teams, including Strawdog, Stage Door Johnnies...Ball Scratchers and Daddy-o&apos;s. Now&apos;s the time for you to create your own ridiculous name. July 1, 6 to 10 pm. - Million Dollar Quartet has been extended through January 6, 2013.